Each Mickey Mousecapade cartridge contains a hidden Mickey soldered onto the circuit board, so kids, remember that after you spend the money to obtain this increasingly rare artifact from game history, you should immediately crack it open with your dad’s hammer (not without adult supervision) so you can behold the awesome glory of a circle intersecting two slightly smaller circles. Interesting bit of trivia, yes, but I don’t know if it amazes me more that Disney, Capcom, and/or Hudsonsoft thought they should put it there, or that someone actually found it. For the record, if you couldn’t detect the sarcasm in my first sentence and actually took that suggestion to heart…then go on eBay right now, buy a copy of “Conker’s Bad Fur Day” and send it to me via USPS Priority Mail. After that, I can send you my wish list…I’ve wanted a powerful telescope for a while…But if you didn’t fling the cartridge to the ground and stomp on it like a tarantula you suddenly discovered climbing up your arm, try putting it in your NES and playing it. 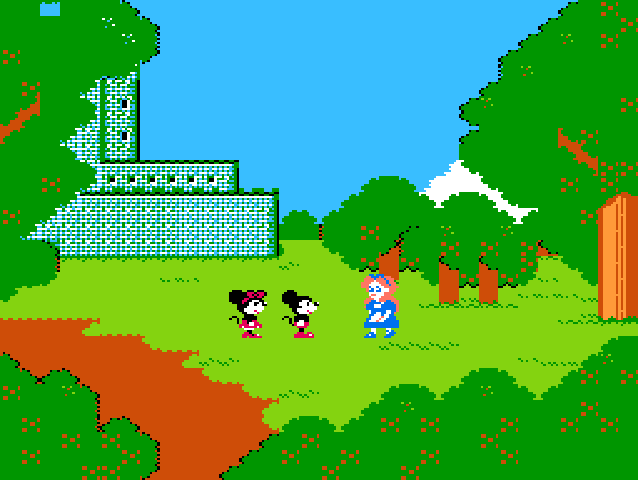 After playing through the Kingdom Hearts games and thinking, “What a bizarre, but novel idea,” it occurred to me that Disney had released video games containing nonsensical assortments of intellectual property since at least the 1980s. 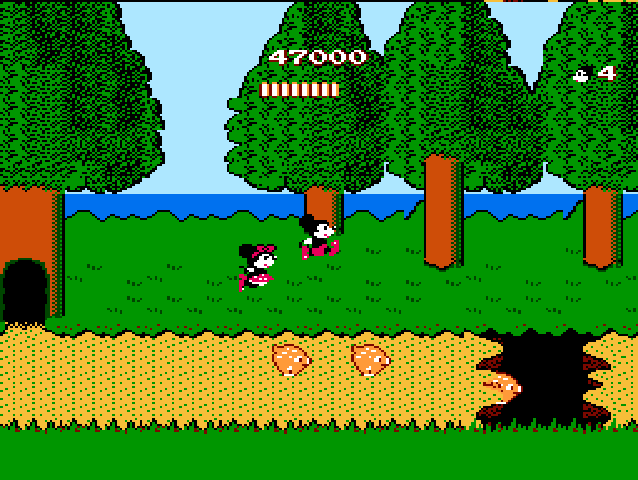 Unlike the Square-Enix designed plot of Kingdom Hearts in which Maleficent abducts Alice, then later uses a host of Disney villains, including Pete as a recurring mini boss, to foil the plans of the team of Disney heroes, Mickey Mousecapade features a team of Disney heroes, fighting their way through a gauntlet of Disney villains, including the recurring mini boss Pete, to defeat Maleficent in order to rescue the captive Alice. (What a novel idea!) I gather they intended for the games characters to surprise English-speaking players as the instruction manual only says Mickey needs to rescue “a friend,” and the English release replaces many Alice in Wonderland themed bosses and enemies with an appetizer sampler of characters. Porcine Kamikaze belong to the same genus as the lemming. The game has little consistency between its five stages, which may actually work in its favor, varying the game play just enough so that players don’t realize the absurdity of the premise, the cliched platforming, and that they can finish the game entirely within the length of time it takes to watch one episode of Family Guy. 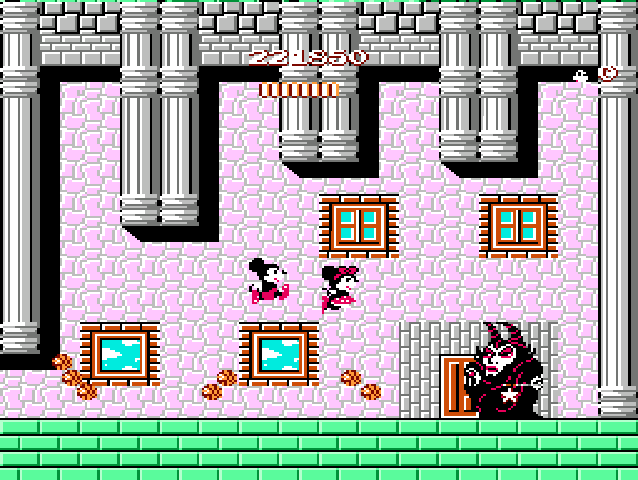 The first and the last stage involve an almost Resident Evil style exploration, where Mickey and Minnie search through buildings looking for weapons and keys, then backtrack through the labyrinth to unlock doors to help them progress to the boss. The fourth level takes this screen-by-screen exploration and reduces it to a single path through four screens. The second stage involves side-scrolling platform jumping without the option to travel left to previously visited screens. The third stage does this as well, but de-emphasizes platforming in favor of searching for hidden exits that will either move you forward to the next area or back to a previous one. From there, each stage has its own quirks and annoyances that make you wonder things like, “If the goal of the Fun House requires unlocking the door to get out, why did Mickey enter in the first place,” or “Why do seasons in the woods change depending on which tree you walk into rather than the passage of time,” or even “What type of pirate would keep their ship in one place, then put up signs telling people how to find them? 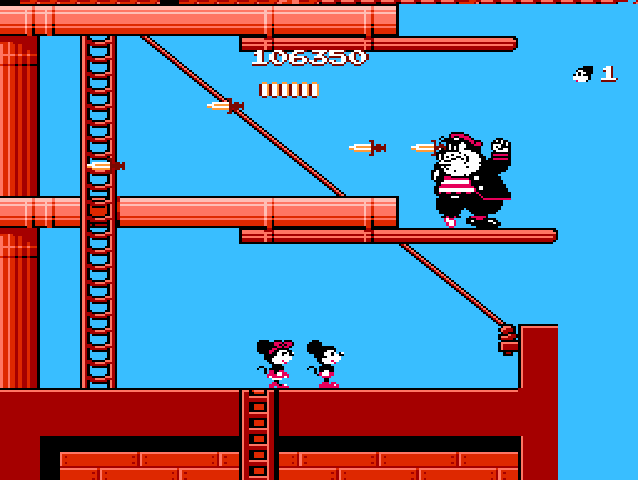 Each level has hidden treasures revealed by a steady bombardment of radiation from your stars, but only in the Fun House and Castle levels do you risk releasing some sort of psychotic owl who kidnaps Minnie and imprisons her in a statue. The woods, as mentioned requires you to memorize a path to find your way from season to season, otherwise you can get lost pretty easily. …no guards. No wall. No chains. Why the hell did I have to save you? Still, it’s a small game world after all, so the variation keeps it interesting. The game puts up enough of a fight to keep you from whipping through it like a teacup ride, and…okay. No more stupid Disney jokes. The only real complaint I have left doesn’t even affect game play; when you finally beat Maleficent into a surprisingly short and squat bloody pulp, you finally come face to face with Alice…as she dozes gently…propped up against a tree. Outside. With absolutely no chains, guards, or other objects to suggest imprisonment. 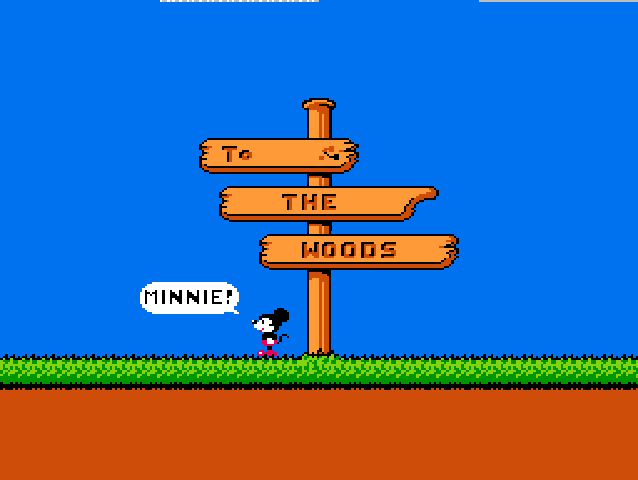 She could have walked away at any time, but instead felt like calling Mickey, the big boss mascot, away from his busy schedule of theme park appearances and cartoon cameos in order to come get her. But really, I can’t find much more to say on the subject. A lot of these simple NES games don’t have much substance to them, so they either have something worth playing for fifteen minutes to an hour or they don’t. This one, I’d say, does. Now if you’ll excuse me, I think I’ll get back to Kingdom Hearts II. 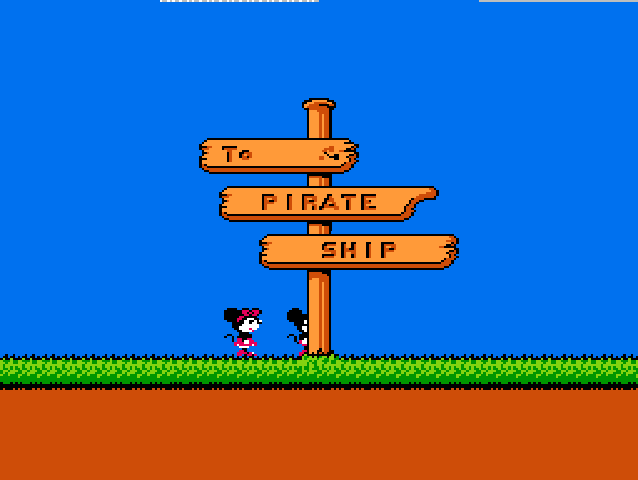 This entry was posted in Disney, NES and tagged disney, NES. Bookmark the permalink. Magnificent items from you, man. I’ve consider your stuff prior to and you are just too excellent. I actually like what you have received here, certainly like what you are saying and the best way by which you are saying it.